Category: Shiromi (white fish) Season: best in the winter or early spring. Kinmedai has a peculiar appearance; it is a bright red fish with very large eyes due to its preference for deep waters. A typical adult specimen will measure 12 inches in length, but can grow to two feet. It is most commonly fished in the waters south of Tokyo, particularly in Kanagawa and Shizuoka prefectures. This particular shiromi is generally served with some of its skin still on. The skin is lightly seared (as pictured above) "aburi" style to tenderize it and release umami flavors from the oils. Another preparation method called kawashimozukuri involves splashing the skin with boiling water to tenderize it, then quickly chilling it with ice. 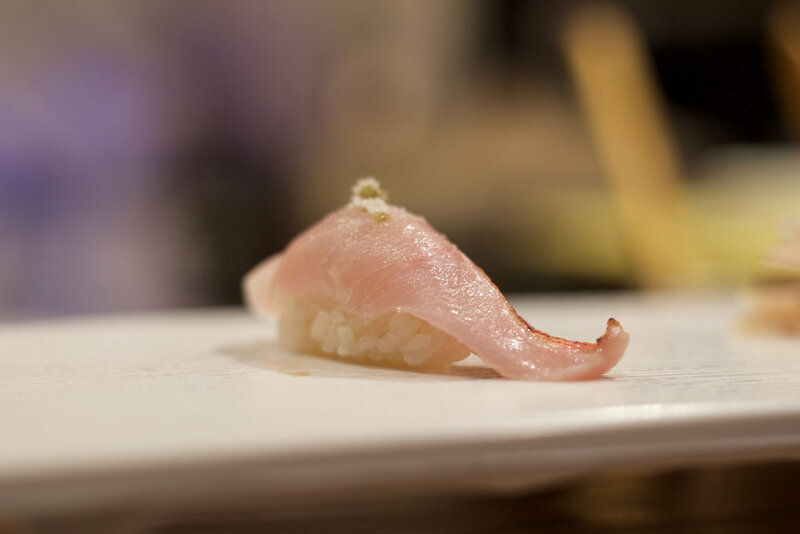 Kinmedai's flesh is delicate and tender, with good fat content for a shiromi and the taste is mild yet full of umami flavors.